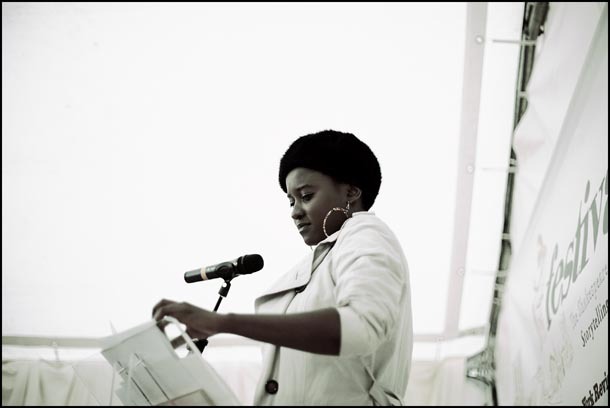 Tjawangwa Dema (TJ Dema) is a Botswana-based writer, poet, performer, columnist, workshop facilitator and 'all round word addict'. She has worked as a mentor for the 2007/8 British Council poetry-storytelling-rap initiative, Power in the Voice, and was a co-founder of Exoduslivepoetry! in 2002. Her words are written to a beat with an unconscious emphasis on acoustics rather than poetic technique, which more often than not takes a back seat to the story being told and how it's being told. She has performed in Johannesburg, Delhi, Cambridge, Harare and many places in between.